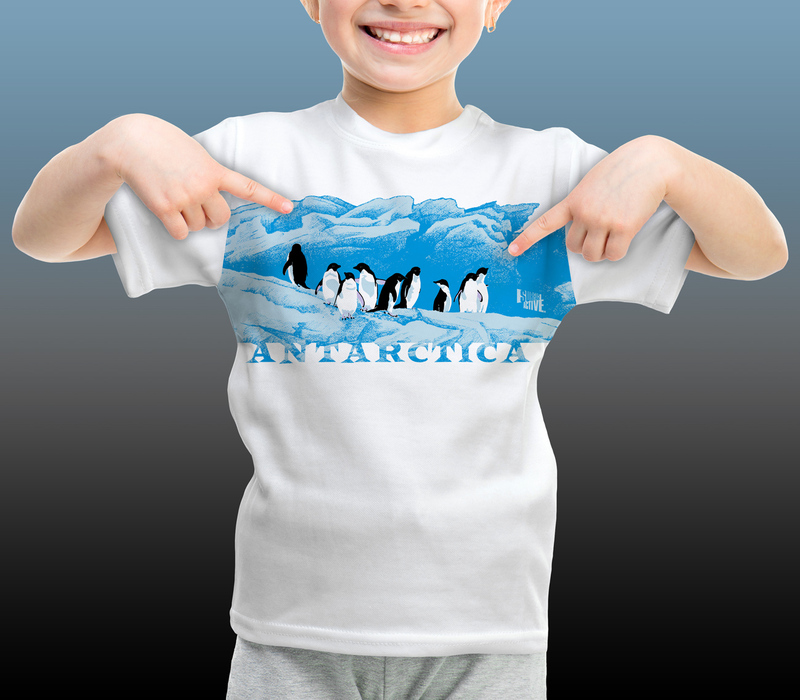 Antarctic Centre “Emperor and chick”, “Weddell seal” and “Adelies on ice” designs, bright, lively T-shirt designs for bright lively kids. Design pARTner Chrissie Terpstra and I submitted eight highly finished presentation visuals of prospective designs into the contest. We were thrilled to learn from the trading manager, Shirley Calverly, that we had swept the competition with seven of our designs selected as competition winners. In 1992 the visitor attraction was opened just a few minute’s walk from the passenger terminals of Christchurch Airport and right next door to the national Antarctic programme offices based in Christchurch, the United States Antarctic Programme and USAF Operation Deep Freeze. Lifelike graphics make a vivid impression because people relate to them, wildlife art, witty designs, prints that customers feel express their individuality have mass appeal, these are the elements of design which are essential to stimulate sales. Antarctic Centre Adelies on ice design for kids, hand screenprinted in four spot colours on a white T-shirt. As this design shows so vividly, it is always a great idea to let the garment colour be part of the screenprint design. 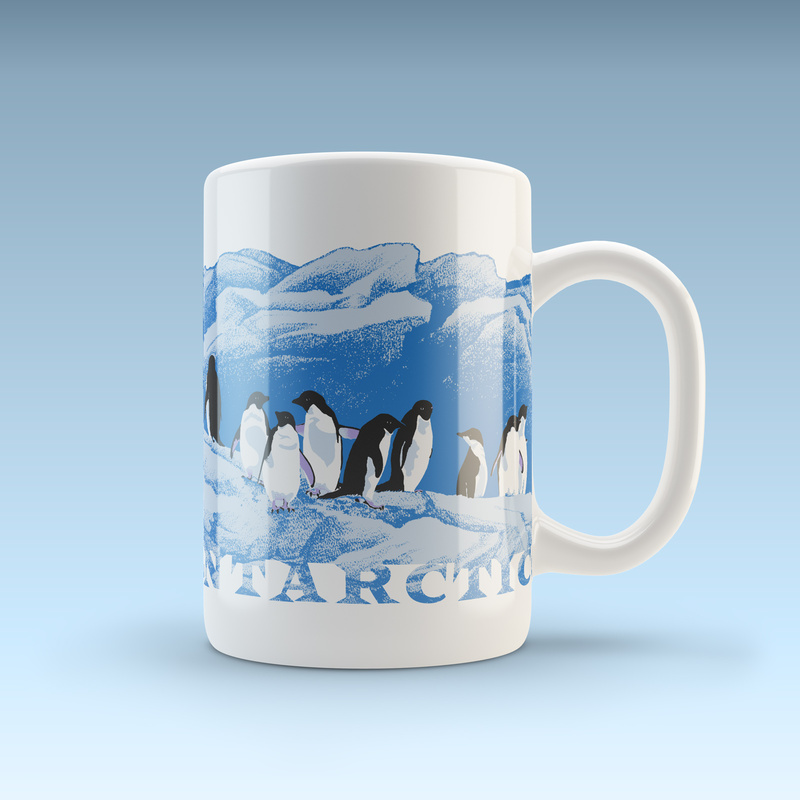 When it comes to a brief like designing souvenir T-shirts for the Antarctic Attraction gift shop the lifelike graphic approach is easier, more appealing than graphical abstraction. Customers relate most to real things, understand them easily and therefore know it is the right T-shirt for them. It is the direct route to an impressive and memorable garment graphic and accelerated sales. 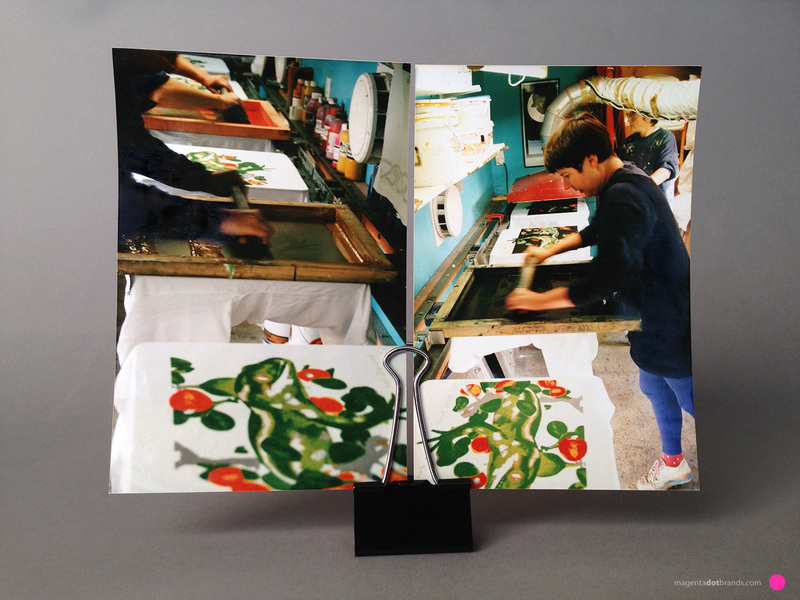 During the concept development stage it is essential to think like a screenprinter, think traditional spot colour hand-separated methods, make sure that every colour counts and where you can “cheat” and let the colour of the shirt be part of the design. From the business point of view printers charge a base price for their shirts, and then charge extra per colour, more screens, more ink, this costs more money. 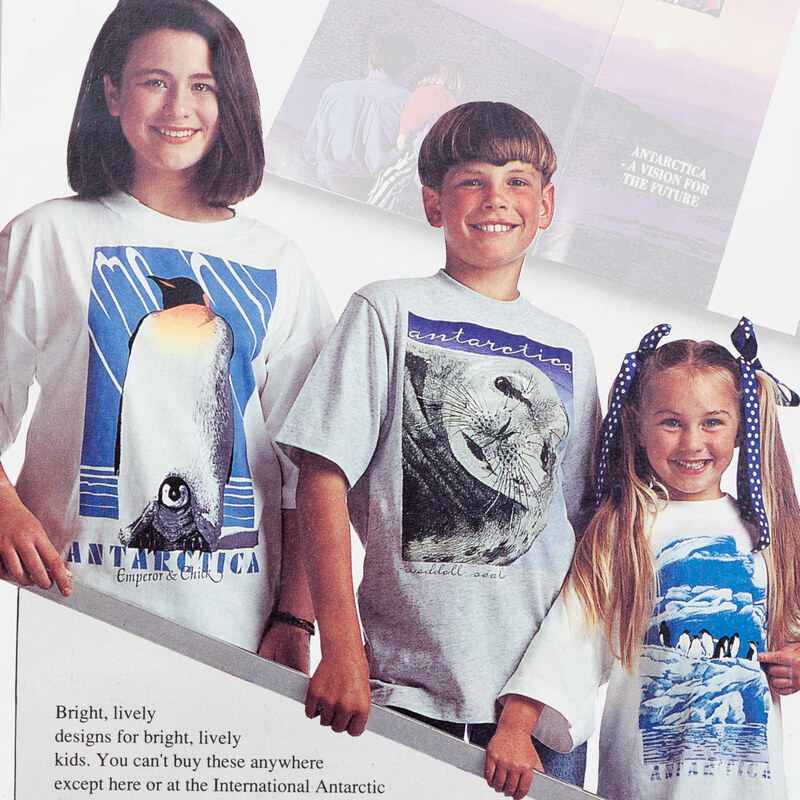 While cost is not the primary factor when determining the designs to print if there are a range of cool Antarctic T-shirts that are equally popular with the public, one using 8 colours is going to be retail at a higher price point than others that only used 3 or 4. There is beauty and perceived value in a thing well made, in small batches, by hand. The public, many of them tourists and people from around the world returning from working at McMurdo Station or Scott Base, when shopping for souvenirs at the Antarctic gift shop liked to have the choice to pick locally made T-shirts from a range of designs, colours, sizes and price points, often buying T-shirts in bulk for everyone back home. Many customers appreciate having the retail price range reflect the range of labour and materials involved in each hand screenprinted design. The perceived value of locally made craftwork accelerates multiple garment purchases because the customer perceives they are receiving an exclusive product for honest and fair retail value for their money. 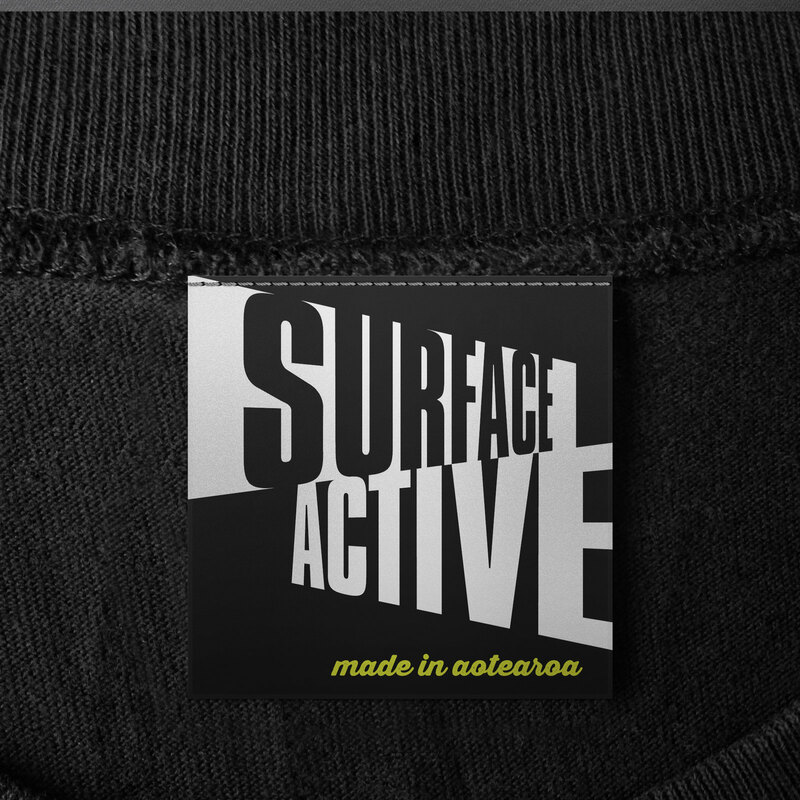 Surface Active: making waves in a sea of sameness. On the aesthetic side the design maxim “less is more” as the colour concept is key, employing overprinting, crafty graduated blends, with a truly great screenprinted design every line, shape, and colour is thoughtfully placed and picked for a reason. Based on the sales performance of the designs on T-shirts several were adapted to be applied to other merchandise. Also it’s a good idea that designs be self explanatory. Good art applied consistently to a custom range of cool Antarctic T-shirts lets the designs tell the story themselves, so when other people see the shirt, they will be able to understand the design too… peer approval achieved! Working to the standard of ‘good art’ the single-mindedness, intelligence and clarity of concept applied across a range helps the customer understand the design, and because they get it this gives them more comfort that this is the right shirt for them, and so on, good art really drives multiple sales. A new immersive experience of Antarctic conditions was added to the Antarctic Attraction in 1998, Surface Active was commissioned to create the branding and promotional merchandise for the gift shop.